Royal Park Protection Group (RPPG) members and supporters, together with representatives from 7 other inner Melbourne community organisations and Parkville community members, attended a large meeting –over 60 attended – held by Department of Health staff on 20 July 2011 for a briefing on “Stage 2” of the new Royal Children’s Hospital (RCH). 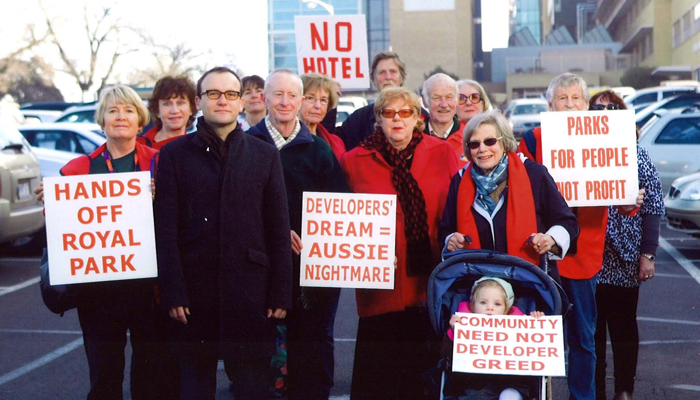 The photo above shows representatives of community groups with Adam Bandt, Federal Member for Melbourne, protesting over inclusion of a 5 storey, 90 room hotel and retail centre, including supermarket and licenced restaurant, in the RCH complex. It will be located behind the glass entrance building seen in background of the photo. To the right see the cream brick H block and Nurses’ Home which are supposedly to be demolished and the site returned to parkland as compensation for parkland alienated for the new RCH. Representatives of community groups met Health Minister David Davis on 24 August 2011 to brief him on the failure of past and present Governments to consult or even inform the community on Stage 2 of the RCH development, namely, inclusion of a hotel and retail centre in the hospital complex; construction of a second carpark for 800 under the hotel extending under Royal Park; and the inclusion of a Zoo in the Hospital foyer (an aquarium and a meerkat enclosure.) We raised: the need for certainty over demolition of old Hospital buildings and the return of the site to parkland, that “returned parkland” will not just be a forecourt for the hotel but part of bushland Royal Park; that the footprint of the Hospital will be only 4.1 hectares as required under legislation not, as estimated, 5.9 hectares; traffic management; and that a community reference group be established to monitor progress and keep the community informed. The Minister has yet to get back to us. See further reports on www.royalparkprotect.org.au. 42 Manningham St: This is a 1 (one) dwelling site. Originally it was to be a split level 4/5 storey development with 11 dwellings. It was later modified to 4 storeys and 10 dwellings. Thankfully, Council refused to grant a permit – on heritage grounds, it being at odds with the predominant character of the area and an overdevelopment of the site. The owner has taken the matter to VCAT. 18 Church St (off Manningham St): It aims to remodel the existing home into 2, two-storey dwellings. No final decision has been made. Unfortunately work began on the house in a heritage street without a permit and, despite a warning from Council, the building’s verandah and façade was ripped off. Report by Margaret Jungworth, RPPG Committee Member & West Parkville Resident. As members will recall, the Parkville Gardens residential development was built on the site of the Royal Park Psychiatric Hospital after 20 hectares of land and the heritage buildings were gifted to Australand, the developer. The deal was that, in exchange, the residential development was used as a Commonwealth Games Village for two weeks in 2006. A wall of 700 residential units proposed to be built along the City Link motorway wall with two 9 storey and one 11 storey tower block was not built as, according to the developer, the market for units was not favourable. Now, however, construction is proceeding for blocks of 3 to 4 storey units next to the freeway. Stage 3 has just been announced with “off the plan” sales to start on 3 September 2011. These will be advertised “all over the world” according to Australand sales. It will surprise members to learn that the Parkville Gardens development is still categorised as a “Games Village” and is under the control of the Minister for Planning. Prospective buyers will be pleased to hear that one inch thick plate glass is to be used in windows facing CityLink to cut out the noise of traffic! Venue: The meeting is to be held in the Walmsley House, Royal Park at corner of Gatehouse Street and Royal Parade Parkville. Entrance off Gatehouse Street. Transport: Tram along Royal Parade. Stop at Gatehouse Street. Parking in Gatehouse Street. Garden, one of Melbourne’s iconic but little known indigenous gardens. Take the opportunity to visit the Walmsley House, a prefabricated iron cottage imported to the colony in 1851 and hence one of our earlies existing buildings. Also take the opportunity to view the golden elm planted next to the Walmsley House and on Victoria’s register of significant trees. People need not stay to the meeting but all are welcome. Contact: Anne Phefley, RPPG Secretary 0412 279 165. RPPG asks all members and supporters to be extra vigilant and let us know if you see the Park being damaged; trees being removed; new unexplained works being undertaken; evidence of graffiti; and/or dogs being walked or let run in “Dogs Prohibited” areas of the wetlands and billabongs. We can take up concerns with the City of Melbourne. Please ring me on 0401 992 000 or Anne or Julianne. See above.